I am buried in revising my draft thesis and the new academic year has started. There are ongoing open initiatives I support and new projects starting, internally and externally. All exciting stuff! 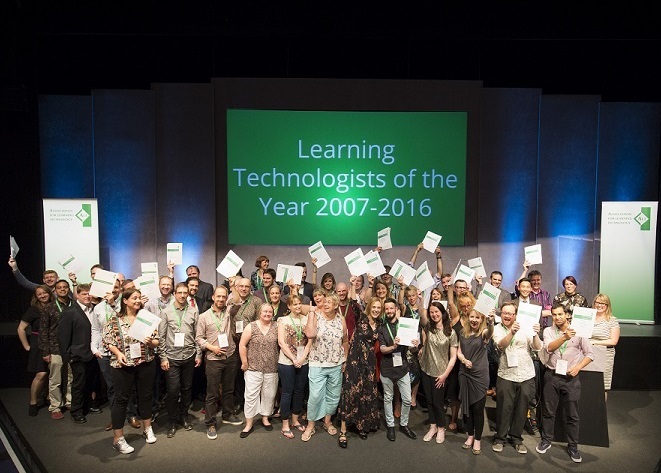 In September this year, I was awarded runner up ALT Learning Technologist of the Year 2016. I feel humbled and honored to receive this award for my work in open education. Thank you Dr Cristina Costa for encouraging me. I would like to take this opportunity to congratulate everybody for their individual and team awards and all highly commended colleagues. It was fascinating to read about their achievements and successes. I really enjoyed the one day at the conference at Warwick University (lovely campus!!! the ping pong table was such a great idea!) and meeting so many innovative colleagues. It was especially wonderful to see Daniel Scott (the big individual winner!!!) and Iain Griffin (Highly commended!!!) and have chats with them. We agreed to stay in touch, which we have, and collaborate on a little project to give something back to the ALT community. We are going to make this happen ;). As an academic developer, digital and open practitioner, with a passion for experimentation it has been a fascinating journey and a pure pleasure to work with many colleagues in my own institutions, nationally and internationally. I feel that I have learnt a lot and their support has given my imagination wings to come-up with ideas that have become reality and are helping us all to engage in new and exciting professional development activities. From my work you will see that I have shared my ideas openly with many others. I guess for me collaboration is not a strategy, it is more a way of being, a philosophy. I also know that ideas can only grow if we share them. My dear friend and colleague reminded me a few years ago of the following African proverb: “If you want to go fast, go on your own. If you want to go further, go with others”. Below are some of the key projects I initiated. You might find some of these useful for your development or they might give you ideas to develop something new in your area. The openly licensed course Flexible, Distance and Online Learning (FDOL), which is a postgraduate module that was opened-up and became a cross-institutional collaboration initially between the University of Salford and the Karolinska Institutet in Sweden (Lars Uhlin was my partner) and later Manchester Metropolitan University when I changed institutions. FDOL an idea that originated from my MSc dissertation, was offered three times, with varying length up to 12 weeks. One of the iterations became a case for my PhD as it had collaborative open learning features using a problem-based learning approach. FDOL provided the foundations for the openly licensed Bring Your Own Devices for Learning (BYOD4L) course. I was keen to experiment with something much shorter and enable different forms of collaborative learning that are community-based. Again it was inquiry-based and scenarios were used, this time in additional video format presenting student and academic staff perspectives I shared the concept with Sue Beckingham and we became partners. BYOD4L was offered for the first time in 2014 and since 2016 the community itself organises it. I think this is an important move and a necessary one, if we want to sustain OEP and create capacity. The next iteration is in January 2017 and I am looking forward to supporting our three musketeers (Neil Withnell, Sheila MacNeill and Alex Spiers), in the background. BYOD4L does have a daily tweetchat feature which was the highlight of the day and attracted large numbers of participants. This triggered a new idea in my mind for a weekly tweetchat that would be a regular CPD opportunity for all of us. While the idea was fresh in my mind, I shared the idea for the Learning and Teaching in HE chat (#LTHEchat) with Sue Beckingham, David Walker and Peter Reed and we decided to go ahead with it Since September 2014 the #LTHEchat has grown and the introduction of rotating organising teams as well as the collaboration with the #HEAchat has enabled it to grow further and become a popular weekly gathering of practitioners with rich and varied exchanges and debates around learning and teaching. I had in mind to do something with FDOL, to take it into a new direction and this was materialised through using it and building the openly licensed course Flexible, Open and Social Learning or short FOS (Do you know that this means in Greek?). Again, I invited Sue Beckingham to work together on FOS. It was an opportunity for me to become more playful with the original formula, introduce a game-approach, create scenarios, with Ellie Hannan’s help, that were visual and engaging. As FDOL stretched over a series of weeks, again, I wanted to experiment with offering something like this over a week. We have offered this once so far. Creativity for Learning is a postgraduate module I created at Manchester Met and opened-up. We call it #creativeHE and it has become more of a community and an ongoing collaboration among the Creative Academic network and many colleagues from different institutions nationally and internationally. One of the iterations (8 weeks) became my second case study for my PhD as it had collaborative open learning features in groups which were different from FDOL and it was a useful opportunity to explore how participants experienced it. It is a wonderful opportunity to become more playful and creative in our practices and the work we have done so far evidences that this is happening. This year we decided to launch the Creativity in HE project led by Prof. Norman Jackson with many happenings until the summer 2017 via #creativeHE. The #greenhouse community at Manchester Met has lined up with the Creativity in HE project and I invited Ellie to lead the micro-project #101creativeideas. If you haven’t seen this yet, please have a look and contribute your ideas to this OER project. Then there are the Teaching and Learning Conversations (TLC) webinars which start again this week. An initiative I brought to life when I was at Salford University, which has now grown into another cross-institutional collaboration with rotating organising teams. I guess the OER series Food for thought dates also back to that time and is something I would like to continue developing as well as find a way forward for my wheels idea. Yes, an exciting and full academic year is ahead of me. I plan to finish my PhD studies (must work hard on this until then!!!) and work with many colleagues on learning and teaching projects that open our minds to new possibilities and practices. ps. A very special thank you to Neil Withnell.